The Texas Rangers, the oldest law enforcement body on the North American Continent with statewide jurisdiction, which are recognized throughout the world for their accomplishments. When you hear the name Texas Ranger, one does not always know for sure if the subject is baseball, a theatrical scene, or law enforcement. Many radio programs, movies, books, and TV shows have all attempted to tell the Ranger story and portray the Ranger’s since of pride. While others want to seek name identification with the Texas Rangers which is synomous with integrity, courage, and honor. The history of the Texas Rangers is in a since the history of Texas itself. In 1820, Stephen F. Austin, best known as the father of Texas, requested and received permission from the Mexican government for 300 families to enter the territory of Texas. By 1823, the need became apparent to create a force in order to provide the pioneers with protection from hostile elements. On August 10, 1823, since Texas was then a part of Mexico, Stephen F. Austin sought and obtained additional permission from the Mexican government to employ ten men, from a group of volunteers, to protect the new Texas frontier. Thus, the history of the Texas Rangers began with duties to "range" over wide areas so as to scout the movements of the renegade Indians. From these ranging activities, the Texas Rangers derived their name. In 1835, the Texas Rangers were formally organized with twenty-five men to form one Ranger Company. The control of the Rangers was placed under the command of the military Commander-in-Chief of the forces of Texas. At that time, the Ranger’s primary concern remained, to protect against hostile Indians but was also structured to protect against outlaws and Mexican bandits. In order to survive Rangers were forced to learn the Indian ways, which included learning, horsemanship equal to the Indians. The Texas Ranger organization became better established during the period of the Republic of Texas, 1836 to 1846, but the Rangers were not without criticism and underwent movements of abolishment. Rangers were able to survive because the organization was structured in a less expensive manner than that of a regular army. The Rangers did undergo short term of abolishment but were always called back into service. The early years was that of conflict since Texas and Mexico were in constant dispute over territory. The differences finally lead to a war between Texas and Mexico, when Texas joined the Union and became a member of the United States in 1845. In 1846, General Zachery Taylor formed troops to cross the Rio Grande into Mexico. The Texas Rangers became a part of Taylor's troops and thus, undertook a new dimension. The Rangers became a part of a complete military structure yet, this did not alter their effectiveness. The Rangers gained national prominence for the first time and were considered to be the best troops in the American Army. For ten years following the end of the war with Mexico, the tasks of protecting the frontier was assumed by United States Army troops. The Rangers saw little service during that period, but in 1861, Texas seceded from the Union leaving the total job of protection once again to the Texas Rangers. The Rangers soon occupied the forts abandoned by the United States troops and readjusted so as to provide protection for the residents of Texas during the Civil War years. When the Civil War ended., the Ranger force was disbanded by the United States Military authorities. A part of Texas ceased to exist not because of disorganization within the Texas Rangers but because of the historical period of Union control. The frontier was soon to become unsafe when corrupt politicians gained control of the military forces. In 1874, the Texas Legislature, once again controlled by honest and responsible men, passed a bill creating six Ranger companies and a special force of one Ranger Company. The responsibility of the Rangers became two fold; protection against Indians and restoring law and order in Texas. The six Ranger Companies, known as the Frontier Battalion, served primarily in the protection of the settlers from hostile Indians until 1881, when the last Indian battle was fought at the Diablo Mountains, in Far West regions of Texas. The Special Ranger Force was assigned the task of restoring law and order. The Special Ranger Force existed until 1881, and the Frontier Battalion existed until 1901. In 1901, the Texas Legislature reorganized the Frontier Battalion into the Texas Ranger Force. The Texas Rangers were divided into four companies; each company consisted of twenty men. With the reorganizing of these companies, a new role of responsibility faced the Texas Rangers, the hostile Indian and the routine outlaw became a legend of the past. Texas was becoming modern and with the modern trend the Rangers were faced with new and different problems. Trouble erupted in Mexico and extended into Texas. 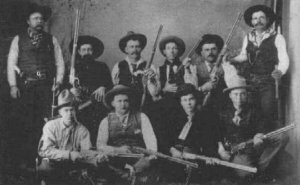 Many new inventions came into view; the prohibition act, the oil field boom, and the ever-changing criminal techniques were all part of the new problems that faced the Texas Rangers. In 1935, 112 years to the very month that the Texas Rangers were first organized, the Forty-Fourth Texas Legislature created the Department of Public Safety. The Texas Rangers, who had been shifted some years before to the Adjutant General’s Department, was made a part of the Department of Public Safety. As a result of this legislature, the official name of the Texas Rangers was assigned to this long time law enforcement organization. The Texas Rangers were created by the Texas Legislature, which set forth-organizational limits, and the legislature retained the sole power to alter the organizational structure of the Rangers. The newly created Rangers were formed into six companies, lettered from "A to F", and commanded by a captain. The number of the Rangers is set by the legislature, which has doubled in strength since 1935. Today, the Rangers number just over 100. The legislature also made a provision for the appointment of 300 special Rangers, for use in emergency situations. Since 1935, the Rangers have experienced little change as compared to the changes undergone during prior years; only those changes to keep pace with the changing times have been implemented. The basic organizational structure as well as the vested authority of the Rangers has remained relatively unchanged. A Texas Ranger was given the same authority of any other peace officer but no special authority except jurisdiction, which extends to all parts of Texas. At some point, the Texas Rangers were given special authority to make arrests when the offender was traveling on a railroad, in a motor vehicle, in an airplane, or in a boat but this authority has since been repealed. The Texas Rangers have the same power as a sheriff to execute civil process. The seventies found the DPS faced with a wave of technological progress and unprecedented growth that has continued into the nineties. The growth was predictable since Texas is a favorite state and has much to offer in the wave of progress. The modern Ranger has risen to the challenge and has accepted the traditional expectation to be the very best. Rangers are better trained, and educated then ever before in the history. Even though their number has just reached just over the 100 mark, they still fall way short of one Ranger for each of the 254 counties in Texas. Yet, with the repetition of "One riot, one Ranger," the Rangers don’t seem to need a massive group to accomplish their mission and maintain their reputation. Company headquarters are located in six geographical locations. Houston is the headquarters for Company "A", Garland is the headquarters for Company "B", Lubbock is the headquarters for Company "C", San Antonio is the headquarters for Company "D", Midland is the headquarters for Company "E", and Waco is the headquarters for Company "F". Many think that Waco is the statewide headquarters since the Ranger hall of fame is located in that city. The statewide headquarters, however, is located in Austin, Texas, at the Texas Department of Public Safety headquarters (DPS). In 1991, the Texas Rangers were formally reorganized as a division in DPS with the Senior Ranger Captain (Chief) reporting directly to the Director of DPS. In 1993, this reorganization recognized the Texas Rangers as a major Division in DPS and was formally adopted into law. The modern Texas Ranger dresses in civilian clothes and is recognized by his western hat and western boots. Badges, still made from a Mexican coin, can be seen pined to the shirt above the left pocket. Their duties vary by assignment but are generally criminal investigative responsibilities, which serve to support local law enforcement.